A gold sphere is submerged in water. It is suspected that the center might be empty or made of some lighter material. 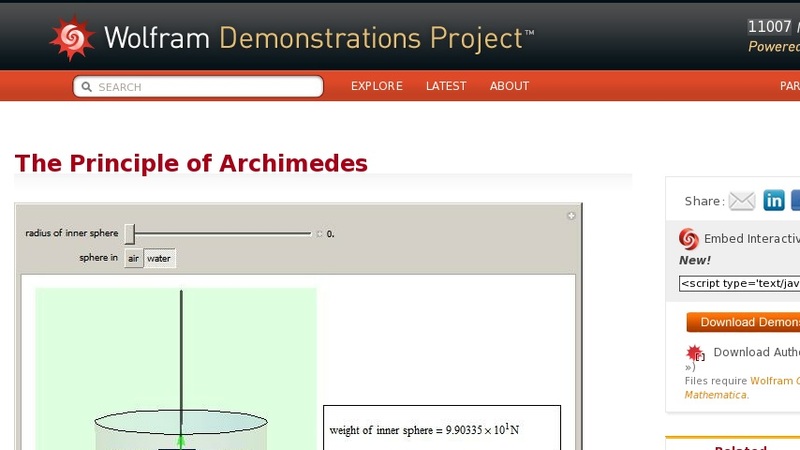 According to Archimedes's principle, we can determine the volume of the inner sphere by measuring the difference between the weight of the entire sphere in and out of water; that difference must be equal to the buoyant force, the weight of the volume of water displaced. Then the difference between the volume of gold in the hollowed sphere and the volume of the water displaced equals the volume of the inner sphere. This experiment supposedly originates in a problem solved by Archimedes, who was asked by the king if the royal crown was made of pure gold. According to the traditional account, the solution occurred to him in a eureka moment in the bath. The density of water is ... and the density of gold is ... . The weight of the solid gold sphere is equal to ... . The volume of water displaced is ... . The buoyant force is ... .